The Dreamcast was awesome, and we were sad to see it disappear in the face of Sony's PS2. At this point, we thought that Sega was officially out of the business of making consoles: the flame had been extinguished...but no more. Introducing the "Toylet." 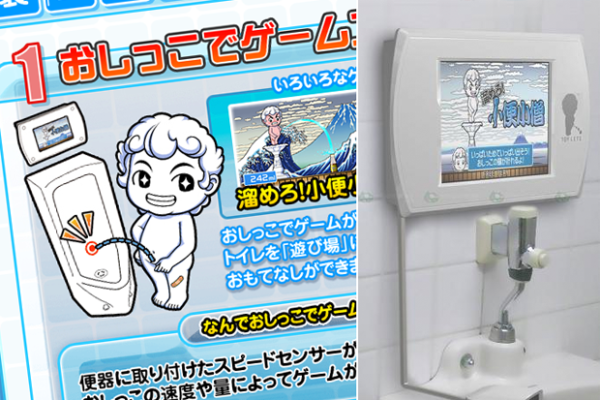 Remember the urinal gaming concept we found before? Turns out the guys at Sega fell in love with the concept, and created their own console to enter this clear market, full to the brim with credibility. Instructions are simple: pee to play the game. A pressure sensor is installed onto the back wall, acting as your controller for a series of five games, including one where you try to blow up a girl's skirt. The harder you blow...well the harder you pee, the more pressure you put onto the button, allowing for the skirt to raise higher. Tempted? Thought so. Why not dig deep for that £1,300 you have going spare? The ads served by the device may pay the difference for you over time. One issue we find though, the duration people have to pee vary from the achingly long to the surprisingly minute. How can this be tackled: midway through the game and the tap goes dry. A save option?